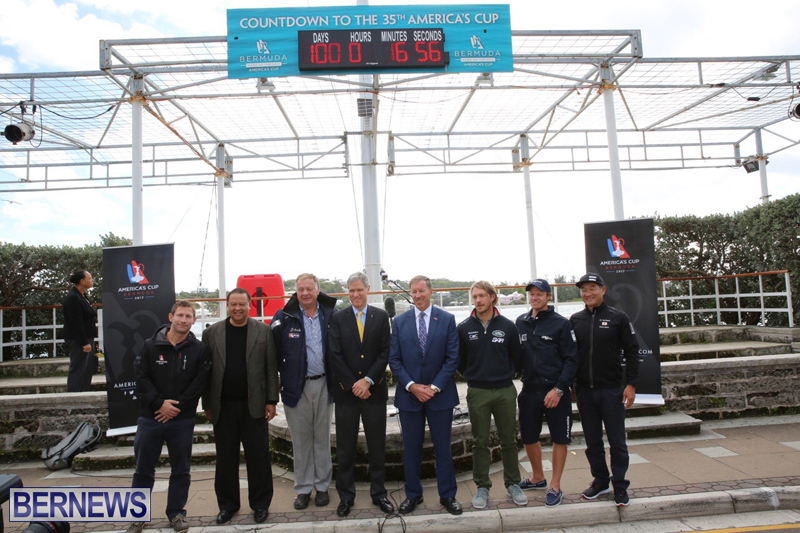 With 100 days to go until the 35th America’s Cup, the America’s Cup Bermuda [ACBDA] today [Feb 15] unveiled a countdown clock at the Flagpole on Front Street to commemorate the occasion, with the clock counting the days, hours, minutes and seconds until the first America’s Cup race on May 26. The Front Street countdown clock is the first of three; the other two will be installed in Dockyard and at the LF Wade International Airport in the coming weeks. Premier Michael Dunkley said, “This is a historical and exciting time for Bermuda. To help mark the occasion we are officially unveiling the America’s Cup Countdown Clock. We see the America’s Cup Countdown Clock as a great way to continue the momentum and anticipation the America’s Cup has generated. Minister Dr Grant Gibbons echoed the Premier’s sentiments and said, “We’re delighted at the prospect of welcoming thousands of visitors and participants to our shores and seeing Bermuda on the world stage. “Now that we’re only 100 days away from the final stages of America’s Cup 2017, I’d like to express that it has been an extraordinary journey and privilege to have been involved in Bermuda’s preparations to date. In addition to the clocks being installed, two teams have launched their America’s Cup Class Yachts on Island, signaling how close the event is; Land Rover BAR launched R1 last week Monday and Oracle Team USA launched their yacht on Tuesday evening. More boat launches are expected in the coming weeks. ACBDA CEO Mike Winfield said, “After over two years of planning and preparation, we are now down to the final 100 days. The time for planning is now drawing to an end and the time for delivery is beginning. Hundreds have volunteered their time to the development of the plans, many, many more will be contributing to the delivery of the event. “Now, our extensive maritime history will fast forward to the delivery of the most dramatic and widely watched maritime event in the sports arena. 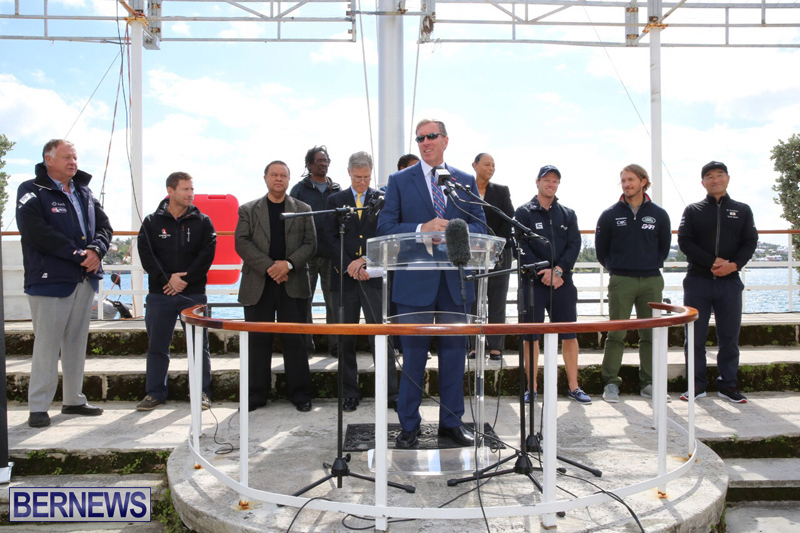 While many Bermudians may not have been fans of the America’s Cup two years ago, many Bermudians are working together to bring this event to reality on time and on budget. 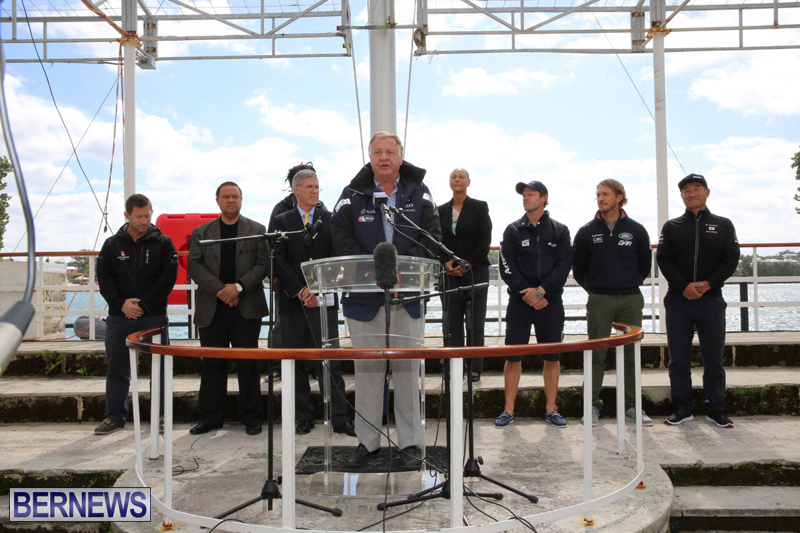 “We have much to be proud of and the six weeks of AC35 is a once in a lifetime opportunity for Bermuda. We will deliver our responsibilities with the degree of excellence the world has come to associate with the name Bermuda. Are you serious?!? Who paid for that clock? Better not be Bermuda. I don’t think countdown clocks are necessary and a waste of money. Are you serious?!? Thing probably cost $100 from Home Depot. You win the dumbest comment of the year award for the rest of the year! A brain is necessary though! We don’t have a Home Depot! Stick to matters in your own country!!! Firstly it was an expression ya dummy but you didn’t register it lol and um from here lmfao…BORN BERMUDIAN if that makes you feel any better! Still waiting for trickle down effect. Get off your a55 then. stop waiting for handouts, get off your a%% and do something for yourself….do you have any skills, or is this the reason you’re so bitter? What we need is a national debt counter to remind us of the financial mess the PLP put us in! Great idea! Install it on the grounds of that ugly mess on the south shore Warwick. You mean where the America’s cup people are staying? Why is it that they can use the grounds and not people who actually needed housing? That’s right, the OBA doesn’t care for the poor Bermudian who can’t afford housing, so they gave it away to the rich. The OBA has doubled our debt. Why not start there? The PLP increased debt from $300m to $1.7bn in five years. The OBA increased debt from $1.7bn to $2.5bn. What do think the word ‘doubled’ means? Love how you don’t include the new numbers from the airport in this. Some people don’t get around much. Count down clocks are common for major events in communities. Can be a sporting event, an entertainment event, no matter. They are stuck up in some highly visible place to generate enthusiasm or on the events website as a reminder for those planning to attend. For OJ & SW May & June 2017 will be like any other May & June. Time & the world will pass them by. A spectacular event for wealthy people, trying to entice poor people to buy into it with a promise of a trickle. Well some fell for 2000 jobs so it might work. You never cease to amaze me with your lack of basic knowledge. Juice you so green with envy and hate smoke a spliff just make sure it’s under 3 grams. A countdown clock for the General Election would have been a nicer thing. Presumably it won’t now be for quite a while, in view of Government’s big lawsuit against Lahey Clinic. We don’t need an Elections clock; both parties are already in Election mode. Some people oogle the opulence of the rich and can’t wait to see them party at the taxpayer’s expense. Others are still over here concerned about police violating court orders and schools that don’t get money because they don’t make money. This race is a slap in the face to every struggling Bermudian. Then they want our people to volunteer to work during this rich man’s game, like it’s not billionaires playing. We are not an island of free labour. This is NOT a charity event! I’ll have plenty to celebrate in May, Mother’s Day, Relay for Life, Bermuda Day. And then in June, Queen’s Birthday/Hero’s Weekend is still going to be on, though we had to move the raft up to accommodate this event. I don’t plan to see this because I’m not into sports like that anyway. Trying to force people to like this is ridiculous! We don’t have to like anything. You won’t be missed, no one really cares whether you like sports or not. All you’ve done is b!%@h and moan about it anyway. stfu. Say what you have to like yourself first before you can like anything else. Am I the only person who is tired of hearing about America’s Cup? I have absolutely no interest whatsoever. But you have time to post your opinion on something that you have no interest in. I wanted to see the clock.